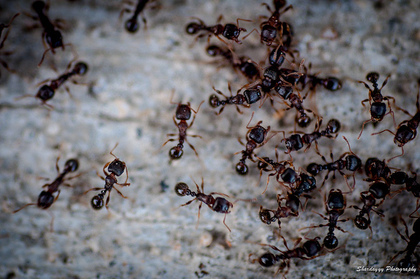 Odorous House Ants or Sugar Ants are small but should not be underestimated in the damage that they can cause to your home or business. People usually categorize “Sugar Ants” as any small black ant that doesn’t sting so it is hard to tell exactly if your problem pests can be Odorous House Ants. That is why It's best to have one of our professional pest experts help determine the best course of extermination.Odorous House Ant is the hardest ant to remove of all the ant species in the Coeur D' Alene and North Idaho area. Below are some helpful facts about Sugar Ants. Odorous house Ants are one of the most common ants found in suburban areas and can vary in size but are usually 2-15mm in length. They are usually always black in color but can sometimes be a brownish color. Sugar Ants are most often found in the kitchen, bathroom, laundry room, doors leading to outside and any other places that can have traces of food for them to eat. A key trait is their smell when crushed.. hence the name "odorous". It is distinct smell and lasts for a few minutes after crushing the ant. They use this as a form of protection from predators. You can guess by the name of these pests on what they like their diet to consist of, sugar, but they don’t just eat sugar they can forage for different kinds of plants and even spills of drinks on your kitchen floor. These ants are so hard to get rid of because of their resilient nature. They can have colonies as large as 10,000+ ants and have multiple queens to make it hard to exterminate . Don't let your ant problem get this bad!